Our madcap pirates are touring the UK, and ready to join you for a swashbucklin’ adventure! Our pop-up pirates are perfect for any event - walkabout characters at conferences and events, short performances at festivals and fetes, pirate games for team-building events and family gatherings, A wickedly wonderful Murder Mystery Dinner Theatre event for the grown-ups, or even as a stand-alone performance of ‘Treasure Island’ in any location - inside or out, and fun for all the family! Contact us today to find out more about our pirate crew and how they will be a perfect fit for your event! Ring the alarm bells! Murder is the cry. Shakespeare’s quintessential Scottish play with a Walking Theatre twist! Our First Lady, 'Gruoch Macbeth', takes control, and leads her own Lord on a merry dance. Step back through time into a world of magic, murder, intrigue and monarchy as you walk in the footsteps of the real ‘Red King’, Mormaer Macbeth. Suitable for any location, inside and out! Previous performances have included The Scottish Parliament Holyrood, Muckrach Country House Hotel, Findhorn Bay Festival, Loch Lomond Shores, and Oriel Wrecsam. Join Britain’s top antique TV shows hosts for their annual Gala ‘Get It Together’. Your hosts Basil and Sybil, in their truly unique style, will ‘almost’ welcome you for a ‘jolly nice’ night out. Inspired by a much-loved iconic show, you invited to discover just exactly what is going on, because ‘we are darned if we know’! Don’t mention the war! Resistance is in the air, the enemy has marched into town. You must listen very carefully, as everyone has something to hide! Tell your loved ones au revoir and join the mayhem at the café of Rene! What will happen? Je ne sais quoi! Calling all beasties and boggles, and spookies and witches! Nigel the Ninja Witch Catcher is on a mission to hunt down all the wicked witches, and get rid of them all! Can Mandy ‘the Mad’, a trainee witch, help? A slightly spooky walk! Far, far away in the ‘wilder’ woods, all creatures of the dark are summoned to dance at the ‘Skeleton’ wedding. Master Rib Bone, is to marry his true love Ebony, under the silver light of a waning moon. All ghaisties, boggles, witches, wolverines and bats will join the party and see this dead pretty pair wed, and live un-happily ever after. DARE YOU…….? Each year as moonlight falls a ghostly wedding party gather. Doomed to meet until the awful wedded wife and her ghastly betrothed find true love, or not? Can you help them matrimonial bliss! Only true love can break the spell, and allow our specters to R.I.P. Sno White is in danger, and only you can help thwart the Wicked Queen and stop her succeeding in her evil plans! Be you Happy, Sneezy, Bashful, or just plain Grumpy, our heroine needs YOU!! 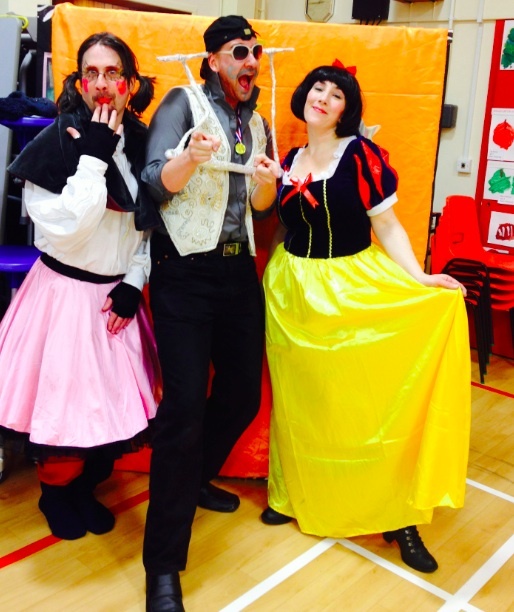 Join The Walking Theatre Company on a pantomime adventure like no other! Suitable for all ages, this madcap interactive adaptation of a classic tale can be performed as an outdoor walk or an indoor production!